Leader Tech has just announced the launch of their newest product innovation – Tech Clip PCB Shielding. 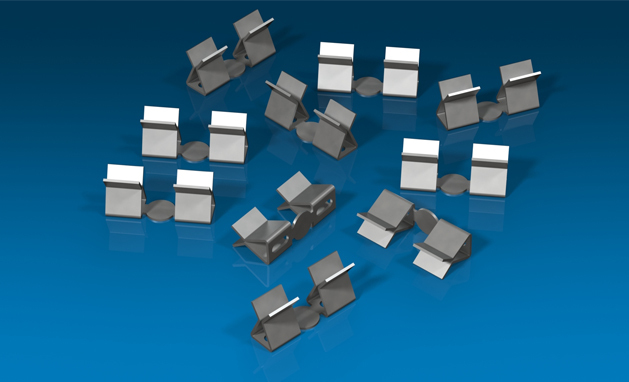 Tech Clip provides one of the fastest and most cost effective solutions to secure EMI shields to a printed circuit board. Electronic boards need to be fully protected against cross-talk by components and from extraneous EMI and RFI signals. The ideal board shielding solution is to use a one-piece Leader-Tech shield that is soldered directly to the board. Often times a two-piece Fence/Cover shield is required for which Leader Tech offers its CBS and Slot-Lok families. A two-piece solution allows for shield removal and replacement for board rework and circuit testing. Now Leader Tech offers yet another alternative to the two-piece shield solution. Tech Clips are a light weight, surface mount design that eliminates the need for fence lay-out and through-hole soldering. Tech Clips are conveniently packaged on tape and reel and can be placed anywhere on the board with virtually no limitations to shield size, shape or height. This allows for versatility of design leading to ease of prototyping and reducing time to market. Tech Clips are designed to securely hold shield covers that range in thickness from .008 -.010. Leader Tech stocks over 20 standard off-the-shelf covers that offer an extremely cost effective solution versus the competition.